This article is about the enemy debuting in Super Mario Bros. 2. For the enemy in Wario World, see Cobra. Cobrats are large desert-dwelling snakes that were first seen in Super Mario Bros. 2, where they would unexpectedly spring from sand or jars. Their name is a portmanteau of "brat" and "cobra", which is a kind of snake famous for being charmed out of baskets through the use of flute-like musical instruments. Perhaps in reference to this, they are said to be under the command of Wart. The Super Mario Bros. 2 boss Tryclyde resembles a three-headed Cobrat. In Super Mario Bros. 2, Cobrats jump out of the sand or jars to attack, and most of them can spit out black projectiles similar to Snifits. They appear in the desert levels and are easy to defeat if in a line; the player can throw one and cause a domino effect. They can be avoided easily and only pose a threat when in large numbers. In the version of Super Mario Bros. 3 included in Super Mario All-Stars and Super Mario Advance 4: Super Mario Bros. 3, the king who rules Grass Land is changed into a Cobrat by Larry Koopa. 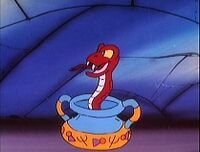 A typical Cobrat from The Super Mario Bros. Super Show! Cobrats appear several times on The Super Mario Bros. Super Show!, where their size varies from minuscule to exceptionally large. The role of Cobrats in the show varies, as they occasionally appear as enemy monsters and on other occasions are be used as handheld weaponry, capable of firing small, exploding black orbs. They are used as transportation in the episode Star Koopa. A Cobrat also appears in "Butch Mario & the Luigi Kid", where Sheriff Mouser uses it as a weapon. In the Nintendo Comics System story Just Deserts, two Cobrats, which are capable of speech, appear as inhabitants of Bowser's desert fortress; the story itself makes it ambiguous as to whether or not these two Cobrats are actually affiliated with Bowser or simply live in his pyramid fortress. In Leaping Lizards, an unnamed Cobrat competes in the International Mushroom Games as a member of a team called the Sneaks. It participates in the Beetlebowl (an all-team event) and the Super Triple Jump, where it leaps by coiling its body up like a spring. 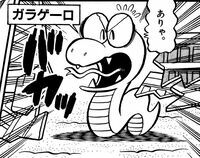 In volume 8 of Super Mario-Kun, a Cobrat breaks out of a fake drink vending machine located in a desert. Yoshi shortly eats it. More Cobrats appear out of jars. Birdo tries shooting eggs at one, but the Cobrat eats them. Mario then dives into a jar to obtain a POW Block. He then uses it to defeat the Cobrats. Cobrats springing out of a jar as it breaks in Mario Kart 7. After a very long absence, Cobrats, known simply as Snakes, reappear in Mario Pinball Land. They are a common enemy in the Shifting Sands Stage. In this game, they do not spit bullets and are green instead of red. Their jars are also absent. Cobrats appear on the stage Shy Guy Bazaar in Mario Kart 7. They hide in jars which move around in attempt to delay the racers. When crashed into, several Cobrats spring out. The jar immediately reappears after the shattered jar vanishes. As in Mario Pinball Land, the Cobrats are colored green rather than red, and, they make squawking noises when they leave their jars. Within the same stage, red Cobrat sprites from Super Mario Bros. 2 make up some of the motifs decorating the red-colored carpets found throughout the course - specifically, those covering the market stalls. The game Bio Miracle Bokutte Upa features a boss that resembles Cobrat or Tryclyde. The manual of Super Mario Bros. 2 states that Cobrats often appear in Toad's dreams. In The Legend of Zelda: Oracle of Seasons and The Legend of Zelda: Oracle of Ages, a person named Vasu owns two snakes that look similar to Cobrats. One of the snakes even matches the original color scheme. ↑ 1.0 1.1 "Usually asleep in a jar, it moves on Wart's command, often appearing in the dreams of Toad." - Super Mario Bros. 2 instruction booklet, page 25 (Cobrat description). ↑ Yume Kōjō: Doki Doki Panic instruction booklet, page 34. 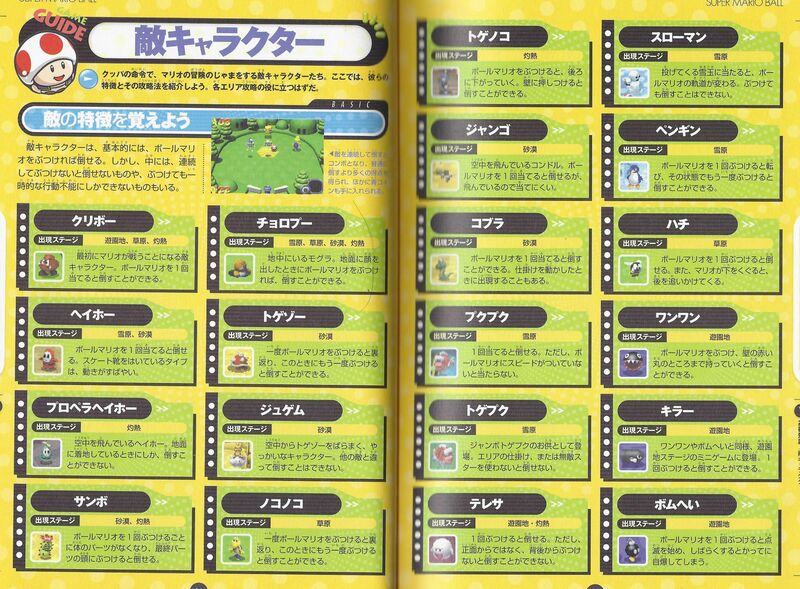 ↑ From the ending scenes of Super Mario Advance as localized by iQue. Reference: 无敌阿尔宙斯 (August 28, 2013). 神游 超级马力欧2敌人官译. Baidu Tieba. Retrieved February 2, 2017. This page was last edited on February 9, 2019, at 11:05.